Sunderland AFC reveal new third kit - but do you like it? Fabio Borini shows off the new SAFC third kit. The Black Cats have unveiled a new third strip ahead of the upcoming 2016-17 Premier League season - and it will become available next week. The shirt shows a pink and purple hoop design, and has a v neck collar, coupled with deep purple shorts and socks. The new shirt. which was revealed by the club last night, bears the name of the club’s principal partner Dafabet. If you want to buy one, the kit will be available across club stores at the stadium, The Galleries in Washington or Debenhams in The Bridges, one week from today (Thursday, June 16). But if you're keen to get kitted out for your holidays, it is available from today at the pop-up SAFC store in Newcastle International Airport's departure lounge. Do you like the new kit? 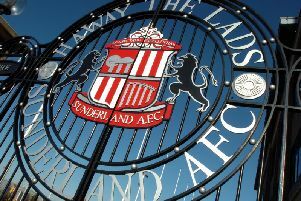 Click here to vote yes or no in our SAFC poll. The new strip is a hit with Sunderland's own Fabio Borini, who took to Twitter this morning to ask fans for their opinions. He tweeted: "What do you think? I love it!" If you want to order it now, click here.